Cabin to rent at Black Forest campsite Müllerwiese, Germany. If you don't want to miss a bit of romance while camping, then you are in good hands in our cabin 3 "Romantic Camping". The cabin no 3 (= hire tent because the cabin is looking like a tent from outside) is situated on site no 48 at the caravan-area nearby the mountain brook Enz. 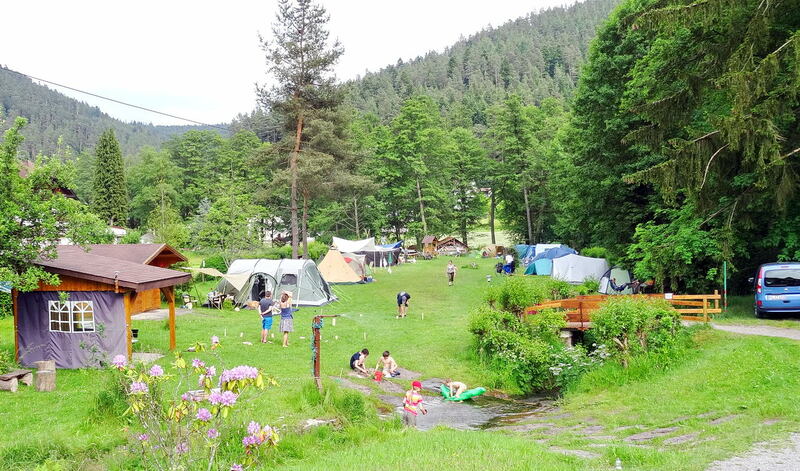 It is located on a 100 square meter camping pitch with sun and shade. At the end of this page you will find a map on which the cabin is marked. In the interior of the cabin there are 2 single beds with slatted bedframes and mattresses (0,90 x 2,00 meters). The beds are not suitable for very large or very heavy persons! For a cozy meal a table and 3 chairs are available in the hut. The firmly fixed cabin has an interior of 2,50 x 4,50 meters. The internal ceiling, floor and walls have all a wood panelling. There is a solid lockable door and three windows which are to open. The interior has an electric ceiling lamp. There is an electric cooker (double hotplate) in the hut. If requested a heater can be rented. Infront of the cabin there is a lawn as well as places to sit, a table and a parasol. Behind the cabin there is enough space to park your car. 2 single beds (0,90 x 2,00 meters). Places to sit and a table. Electric cooker double hotplate and if requested 1 heater. Places to sit, a table and a parasol. with the exception of a tent, mattresses, electric cooker, chairs, table. kitchen things, knife fork and spoon, pots. The sanitary facilities with showers and restrooms are situated in a distance of about 120m. In a distance of 300 - 500 meters there are restaurants where you could have meals or breakfast. a chemist's shop, a beverage shop, a bank and the tourist office. in 300 m in the spa gardens there is a very large playground for young and old. Parking area for your car: directly on the pitch. The smoking of cigarettes, pipes or cigars in the hut. All kinds of open fire within the interior. The use of gas cookers, gas grills or charcoal grills is not allowed inside. However, a grill you can use on the lawn in front of the hut. It is strictly forbidden to use your own heater. A heater can be lended at the camping reception office. Repayment when leaving the cabin in perfect condition.